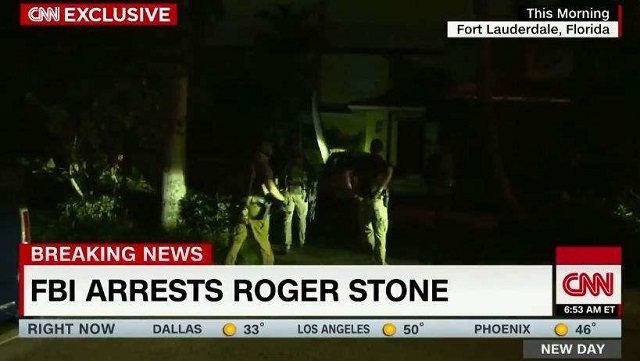 CNN insists they just showed up at Stone's home at 5:00 AM because they had a hunch. Nobody, not even CNN, believes that CNN sent a full camera crew to a single house in South Florida before dawn because it noticed "unusual grand jury activity" (which by law is secret) in...Washington, D.C. It was tipped by someone in law enforcement, and everybody knows it. Roger Stone claims his wife and dogs were “terrorised” by pre-dawn raid. Says he will fight to defend his name and will not flip on President Trump. The case, like every other, is for an alleged process crime, i.e. a crime which was manufactured in the process of the deep state's witch hunt. The special counsel’s indictment of Roger Stone contains no allegation of a conspiracy to collude with Russia or to steal emails from Democrats, and appears to undercut some of the logic behind Democrats’ collusion narrative. Stone, a longtime confidant of President Donald Trump, was indicted Friday on seven counts: five counts of lying to Congress, one count of witness tampering and one count of obstruction of a government proceeding. Special counsel Robert Mueller accuses Stone, a longtime political operative, of lying to the House Intelligence Committee about his communication with Trump campaign officials and other associates regarding WikiLeaks, which released emails that were stolen from the Democratic National Committee and Clinton campaign chairman John Podesta. The question of why Stone may have lied to Congress looms large over the indictment. Stone’s critics are likely to accuse him of lying to protect Trump, his longtime friend. But the indictment, which was handed down under seal Thursday, cuts against the prevalent theory that the Trump campaign conspired directly with Russians to steal and release Democrats’ emails. Stone, who was arrested Friday morning during an FBI raid on his residence in Florida, is not accused of conspiring with Russia or WikiLeaks to hack and release emails stolen from Democrats. The indictment also makes no allegation that Stone had contact with Russians or knew that Russia was behind the hacks of DNC and Podesta emails. Mueller indicted 12 Russian intelligence officers on July 13, 2018 for hacking Democrats’ emails and using WikiLeaks to release the documents. Stone has disputed claims that Russia was behind the hacks. Stone is also not accused of having contact with WikiLeaks or its founder Julian Assange or of lying to Congress in his Sept. 26, 2017 testimony when he denied having any such contact. After being arraigned in federal court in Florida, Stone proclaimed his innocence and said he has been “falsely accused” of lying to Congress. He denied colluding with Russia or WikiLeaks and said he will plead not guilty to the special counsel’s charges. This is a straightforward political persecution on behalf of a criminal deep state seeking vengeance against every last person who helped Trump win. As James Clapper showed in 2013, you're allowed to lie to congress with impunity if you're part of the ruling class working to destroy America. Former Director of National Intelligence, James clapper, lied under oath about the NSA surveillance program. He faced no legal consequences and was instead rewarded with a job at @CNN. This is the biggest witch hunt in history. I wish the FBI raided my sisters killers home in Parkland the way they did Roger Stone.